Grilling chicken kabobs is sometimes challenging, especially when the chicken meat sticks to the hot grill each time you try to turn the meat. The next time you cook chicken kabobs on your gas or charcoal grill, you can take a few steps to prevent the chicken from sticking. With a few tools and some preparation, you'll wind up with perfectly cooked kabobs and no bits of burnt meat stuck to your grill grates afterward. Preheat your grill until the surface is very hot. Light the charcoal or turn on your gas and let the grill heat, covered, until you can stand to hold your hand over the cooking surface for just three seconds. Scrub the hot grill with a wire grill brush to remove old stuck-on food that could cause the kabobs to stick. Marinate the kabobs in a marinade that contains lots of olive oil to preserve the moistness of the meat. However, use a paper towel to wipe the marinade off of the kebabs so that they are mostly dry when they go on the grill to prevent flame flare-ups that can sear the meat to the grilling surface. Thread the chicken onto two skewers instead of one so that the meat doesn't always fall heaviest-side-down when you attempt to flip the kabobs. Rub olive oil onto the hot grates before you put the kabobs on the grill. Soak a paper towel with olive oil, then hold the towel in a set of tongs and rub the oil all over the grilling surface. Avoid basting the kabobs with sauce while they are grilling. Wait until the cooking is done to slather the kabobs with sauce to avoid causing the flames to burn your chicken and make it stick to the grill. 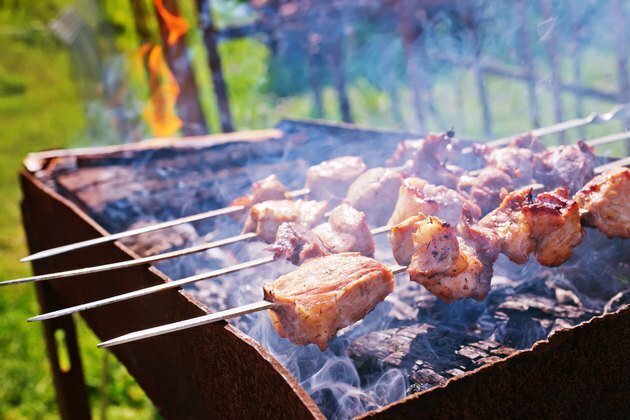 If the kabobs stick to the grill, gently slide a metal spatula between the chicken and the grill to pull the meat loose. Use long-handled tongs to place the kabobs on the grill and flip them as you cook to avoid burning yourself.